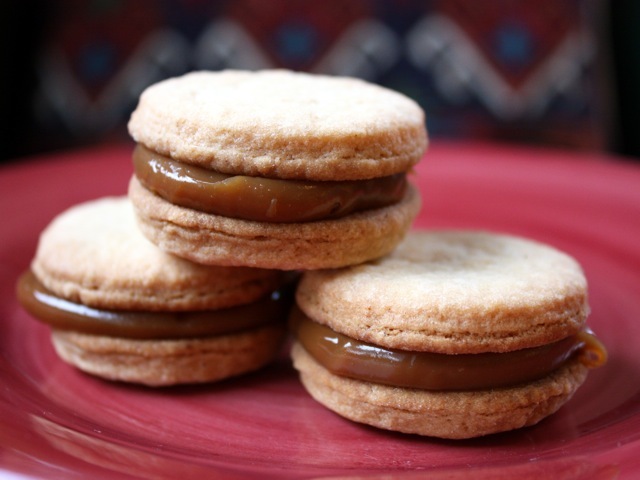 Alfajores are an Argentinian sandwich cookie, in which thick dulce de leche caramel cream is smushed between two soft, buttery cookies. You can make your alfajores super-sweet (a dusting of powdered sugar is common atop many varieties), roll their sticky edges in coconut, or go all out and cover them in chocolate. Pretty much any basic sugar-cookie recipe will work for alfajores, although you may find the resulting cookies either too fall-apart crunchy or too bland. This recipe makes cookies that are both flaky and soft, with subtle flavor from the alcohol and spices. Hard-core DIYers can make homemade dulce de leche, but I find La Salamandra's jarred version perfectly delicious. Put the butter and sugar in the bowl of a stand mixer fitted with the paddle attachment, and beat until creamy and light. Add the egg yolks, one at a time, scraping down the bowl as needed, then add the vanilla and alcohol. Slowly add the dry ingredients, beating until just incorporated. Gather the dough together into a large ball, wrap it in plastic wrap, and chill for at least an hour. When ready to bake, preheat the oven to 350 degrees. Prepare two baking sheets by greasing them with butter or lining them with parchment paper or silicone baking mats. Flour a work surface and roll out the dough until it is ¼-inch thick. Using a narrow-mouthed wine glass or small round cookie cutters, cut out small circles (a maximum of 2 inches in diameter) of dough. Lay the circles on the prepared baking sheets. Bake for 15 minutes, rotating the sheets halfway through, until the edges of the cookies are golden. Remove from the oven and let cool for 5 minutes on the sheets, then remove the cookies to racks to finish cooling. Assemble the sandwiches by placing a cookie face-down, dolloping a small amount (about 1 teaspoon or so) of dulce de leche on it, then placing another cookie face-up atop the caramel. Press down slightly so the caramel filling oozes out just to the edges of the sandwich, then place the sandwich on a serving platter. Repeat until you have the amount of sandwich cookies you wish to serve. Depending on the size of your cookie cutters, you may wind up with anywhere from 16 to several dozen sandwiches. This recipe makes a generous amount of dough; feel free to halve it, or to halve the dough and freeze it for a later round of baking. Store freshly baked cookies in an airtight container for up to a few days. Wait to assemble the sandwiches until just before serving.